WHY IS INCREASING SUBSPECIALIZATION A THREAT TO THE AAN? WHAT DID THE GROUP DETERMINE SHOULD BE DONE ABOUT THIS? WHAT IS THE AAN CONNECTOME? HOW DO YOU PROPOSE THAT BE ACHIEVED? HOW CAN THE ACADEMY REINFORCE THOSE BONDS? As part of their participation in the AAN Transforming Leadership Program, three neurologists discuss their proposal to develop new ways to keep the AAN's subspecialized members involved in Academy programs and resources. How would you define your line of work in one or two words? Neurologist? Stroke (or other) specialist? Physician? This lumper-splitter exercise is not meant to make you appear unidimensional, or to discount your multiplicity of talents, but rather to think about how you identify yourself as a professional, experts told Neurology Today. With increasing subspecialization over the past several decades, the challenge hits home for neurologists: Most of us have more than one way to characterize our profession and more than one subspecialty organization to which we belong. Indeed, results from the American Academy of Neurology (AAN) 2018 Needs Assessment Survey found that 86 percent of respondents belonged to one or more other professional association(s). “The AAN is the home of neurology, but we have always been concerned that subspecialty societies and their meetings could begin to erode our relationship with our members and make us less indispensable,” said Ralph L. Sacco, MD, MS, FAHA, FAAN, president of the AAN and chair of neurology at the University of Miami, Miller School of Medicine. It is why, he said, he asked this year's graduates of the Transforming Leaders Program (TLP) —comprising subspecialists in stroke, neuromuscular, sleep, headache, and oncology and other disciplines — to consider new ways to keep the AAN's subspecialized members involved in Academy programs and resources. Neurology Today spoke to three TLP graduates about their recommendations to do just that: Nimish A. Mohile, MD, FAAN, associate chair of faculty development and division chief of neuro-oncology at the University of Rochester; Vineeta Singh, MD, FAAN, professor of neurology at University of California, San Francisco; and a stroke specialist; and Johanna T. Fifi, MD, director of endovascular ischemic stroke and a vascular and interventional neurologist at Mount Sinai Health System in New York. The three came from different specialties, but what united them, they said, was their common commitment to neurology and a desire to build on their leadership and mentoring skills. Their excerpted comments appear below. Dr. Mohile: Increasingly, subspecialists self-identify with their subspecialty more than they identify with neurology. For example, as a neuro-oncologist, I will often introduce myself as a neuro-oncologist, I primarily associate with other neuro-oncologists, and even within my activities in the AAN, I am focused on what is going on in neuro-oncology. As we engage less with neurology and more with our subspecialty, there is concern that it diminishes the influence that our profession has in science, advocacy, education, and practice. The field of internal medicine has gone through this and today, you can't imagine a cardiologist or oncologist as an internist. If the field of neurology splits into over a dozen small subspecialties, the entire profession will be too fragmented to work together to achieve its goals for the future. If fewer neurologists see themselves as neurologists, they may be less engaged in efforts to change reimbursement models for neurology or in advocating for issues specific to neurologists on Capitol Hill. Dr. Singh: Neurology has quickly evolved within the last few years, and just being a neurologist is not sufficient. The regulatory and administrative changes have strained the system of health care delivery for all, but especially for patients with complex neurological disorders. The increasing demand to provide the best patient care, adequately train the next generation of neurologists (as per the Accreditation Council for Graduate Medical Education Residency Review Committee including work-hour limitations), advance the field, and adapt new therapies and policies, has resulted in the emergence of neurology subspecialty societies. These newly formed societies compete with AAN for a pool of motivated and engaged neurologists. If the AAN continues to serve all its members without special care given to specific subspecialties, neurology will fragment into silos with neurologists increasingly identifying as subspecialists rather than as neurologists. This will make the society obsolete. To stay indispensable, the AAN should thrive as the only alliance of all neurologists. Dr. Mohile: In our group leadership project in the TLP, we felt strongly that the AAN should use its clout with subspecialty neurologists to re-engage them in the profession and strengthen their connection with what is going on in neurology, with other neurologists, and with the neurologist that we all started out as. The concept of the AAN Connectome was created in order to foster these connections and to counteract the fragmentation of our profession. Dr. Singh: Moving towards a solution, our cohort turned to the brain as a model. We shifted from a localization-based model of the brain — where various Brodmann areas represent different functions — to a more interactive, dynamic, and personalized network similar to a brain connectome. We decided to call our model the AAN Connectome. The AAN Connectome is not connections of committees, sections, and task forces, but rather a connection of people with their own affiliations which can serve to maximize their engagement in the AAN. We believe that AAN should strengthen existing connections within the organization and launch new initiatives that can form new connections. We propose breaking silos and finding common ground — whether you are a resident or retired, whether you are a patient advocate or a scientist, whether you are a generalist or subspecialist. A key priority for all members is to improve patient care and create a community of patients. Dr. Singh: There is no quick way to create a community among AAN members, but we hope that the AAN will recognize the value of a community of members within the organization. We believe that when brought together, the unique talents of our members make us a stronger community for ourselves and for our patients. Today, a sense of community seems to be on the decline in our society. We propose that among its values — leadership, integrity, professionalism, commitment, respect, diversity and equality, and compassion — the AAN needs to embrace the importance of community for its members and for its patients. If we want to build a community of patients, we need to be a community of practitioners ourselves. “Ubuntu” is a Southern African concept of community, a Nguni Bantu term meaning humanity. It is often translated as “I am because of all who we are,” often adapted to mean “the belief in a universal bond of sharing that connects all humanity.” According to Archbishop Desmond Tutu, ubuntu is a belief that “a person is a person through other persons.” We believe a neurologist is a neurologist through other neurologists. Dr. Fifi: In my subspecialty society work, I felt disconnected with our broader neurology community and wanted to find a way to bridge the gap. Over the past decade, neurologist subspecialists like me have begun to lose their identity as neurologists. They think of themselves solely in terms of their subspecialty identity. I know that this has occurred to many interventional neurologists. I think it's important for an organization like the AAN and academic departments to keep coming back to central themes of our neurology identity — to find and foster programs where there can be cross collaboration across a few or many specialties and to think of the common goals related to patient care. I also think that it's important for subspecialty societies to think of themselves under the figurative umbrella of the AAN. This can be a mutually beneficial relationship. Professionalism: Neurologist or Specialist: Where Do You Fit In? 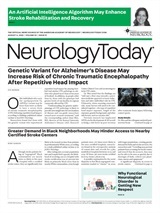 Neurology Today18(18):26-27, September 20, 2018.